Thanks to Anthony Welsh of Cigars City for this very kind sampling. The thing smells like my (cedar, natch) humi, with a hint of red wine at the foot. Sweet earth under-belly. Hi, my name is Kaplowitz. I really do appreciate you taking time away from your busy schedule in order to lend me yer attentions. It is vastly appreciated, gentlepersons. Very pretty top-leaf, yet understatedly so. Veins are moderately present and too void of any potential burn impediments. Seams are invisible. Beautifully tightly crafted triple cap. Foot tobacco is a mousy brown with a singular brunette swirl; medium+ density to the eyeballing. Shaft itself is that mousy brown we'll call milk chocolate... say hot cocoa with milk. Brick red under-hue. Very, very even complected, verily. Nice sheen over-top. Some scant tooth on the hand-feel. That hand-feel has great big heft and supreme balance. Charmin squeeze reveals zero soft-spots on an evenly distributed -full packing density. I moisten the cap to clip and I get a nutmeg taste from the leaf. 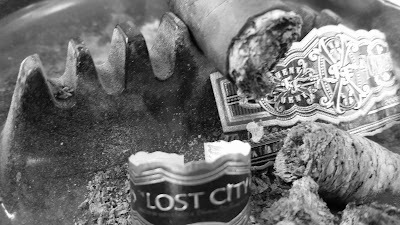 The Xikar Xi2 then does its thing and the Lost City's draw is a very nice medium+ tension. Very cedar cold pulls. Smooths to oily leather blending with crisp earth. Some white pepper riding close to a molasses note. Toasting the foot lets loose an aroma of molasses led leather. Woodsy earth. The procedure is Djeep'd easily and readily. The first hot pull lays a ton of oils across my palate and tongue. Cedar and molasses are forefront. Leather is a lot of the middlings with white pepper and buttery creams. Second hottie is retro-haled to a finely ground and slight black pepper. There's cayenne which drops into the oils on my palate. Eventually it meets molasses. Very floral finish off that retro-hale. Sun-lit dirt starts into the under-belly. The third hot pull is added wood notes alongside the cedar. There's a graham cracker vibe at the finish. That finish is quite long and sweetly full -- almost meaty. Mouth-feel is heavy oils and of perfect moisture. Ash is a sheath of pale grey with a tick of flake in one spot. Burn is even on a -medium thick line. Room-note is sweet cedar and aromatic tobacco (which too finds the middling). Smoke out-put is mucho, but not overly thick. Packaging softened not a single iota against the light. A certain tannic quality finds the floral components. Honey is there, as well. Have you gentlepersons ever drunk Wildflower Mead? That. It's really excellent use of dandelions. A zetz of kitchen spice comes in. So much body here. Full. Profile is a zaftik -full. Strength is low thus far, about an inch in. In that inch there have been flavor notes of: cedar, molasses, leather, white pepper, black pepper, cayenne pepper, floral, dirt/earth, wood, aromatic cedar, graham cracker, mead, kitchen spice and... and... ain't that 'nuff, gentlepersons? NO AND THEN. Not yet, anyways. Combustion and construction are of Opus X quality, natch and 'nuff -- they are inducing of wow. Strength is slowly up to a -medium. Line is even with a singular spot of half-tick of ribbon. My wife sticks her head out and smells honey wine. Some vanilla comes into the cream, as does a nice kitchen spice. The finish is an amazingly long and complex continuation of draw note, mainly of wild flower mead and sweet spices on earthen leather under-bellying. Draw resistance stays at a medium+ tension and I prefer it that way. Only a greedy part of me wants my smoke-hole mercilessly inundated with this Lost City. I can only thank Mr. Andy Garcia and his summer crop demandings for this, of course. Flavor notes are in lock-step stride. I walk to my roses on Double Air-Pillo clouds and oh, boy. I feel nice. Buds-to-blooms on each bush. Even my two babies. I've also begun to grow various varietals of mint along my fat neighbor's fence. The one that blares slow jazz and/or Foxnews radio at 7am and then throughout the day. He takes great pride in his lawn. I wish him the best in eradicating my soon to be sprawling unto him mint. Cedar soars. Then kitchen spices led by nutmeg and cinnamon. But it's all wildflower mead, gentlepersons. My palate and tongue are saturated sponges. Profile is full on delicate notes and luxurious mouth-feel; strength medium. A thicker vein leaves a streak of nigh charcoal in its wake on the pale grey ash sheath, but doesn't fray the line. The secondary band removes in a jiff, sans affair. Humsoever, the main band seems to want to take top-leaf with it. A dab too much glue was employed. a tick of wrapper is loosened. Drats, gentlepersons. Please pardon my French. Packing softens a tick and a half here, and the draw dips to a medium tension. Strength ups to medium+ but kindly so. Body is down a tick to medium+. Very floral with a high underbelly of sunlit dirt. No notes have fallen off, but the field is mayhaps a tick more narrow. Still, it's vastly the same experience -- and a quite lovely one at that. Simply, there is just not a lot more here to relay to ya, Dear Reader, now. My broche is answered and the half-fercockt bit of top-leaf get smoked through sans tsuris. There is a hint at some bittering via a sharpening of the cedar, but purging side-steps this and leaves behind a clearer delineation of notes. A toasty note crisps the cream a nice bit. A chamomile vibe comes into the lower middlings. Notes hold. Construction and combustion hold. Another vein does the same trick as mentioned in a previous vein. No big whoop. Cayenne rears and tingles the tip of my tongue at the band. 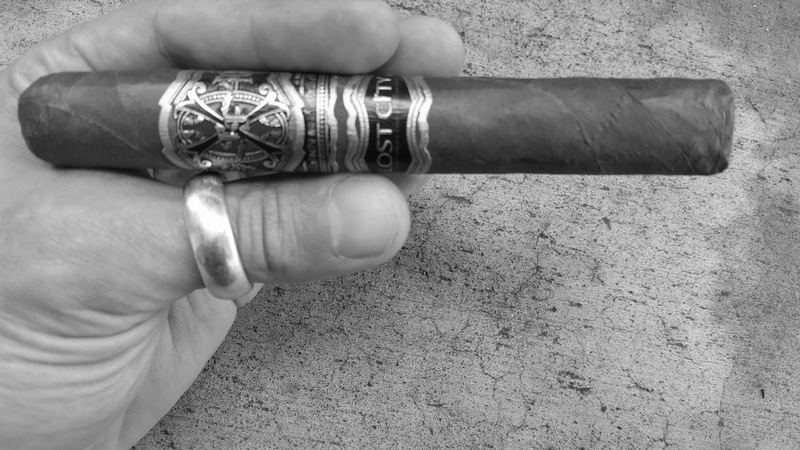 I am set to toothpick the ever-lovin' heck outta this Opus X, gentlepersons. A tick of nigh fercockt top-leaf due to excess glue. I'd have loved a true transition... but I have loved this X. My schmatta never left my back pocket, such was the solidity of the ash. Weight of smoke has me thinking I maybe gained a pound or two. Nothing is required, but try some chamomile tea, particularly in the final act. You can listen to an audio version of this review HERE.